Australian media outlets have reported that undefeated two-time Australian Horse of the Year Black Caviar's first mating will be to Darley stallion Exceed And Excel (AUS) (TrueNicks,SRO). Exceed And Excel was, like Black Caviar, a sprinter. His first of two group I wins at 3 came in the seven-furlong Dubai Racing Club Cup (now known as the Sir Rupert Clarke Stakes) shown below. En route to being named Australia's champion sprinter for 2003-04, Exceed And Excel took the six-furlong Newmarket Handicap (Aus-I), a race also won by Black Caviar in 2011. Her win—one of her most impressive—is shown below. Back in April on the TrueNicks blog, we asked you which stallion you would select for Black Caviar. In a poll on that blog, Exceed And Excel got no love, getting only 3% of the vote. Frankel, Redoute's Choice (AUS) (TrueNicks), "Other", and Fastnet Rock (TrueNicks) were all more popular choices in the poll. But Exceed And Excel impressed Black Caviar's connections with an incredible year at stud. 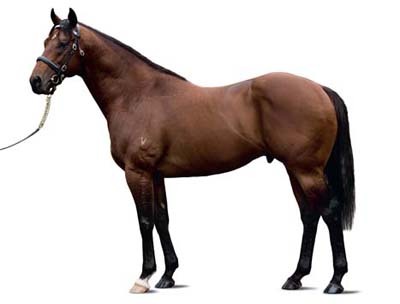 He sired the first- and second-place finishers in the Golden Slipper (Aus-I), the most important Australian race for 2-year-olds, and also talented filly Guelph, who captured both the Sires' Produce (Aus-I) and Champagne Stakes (Aus-I). Not surprisingly, Exceed And Excel is the leading sire in Australia for the 2012-13 season, with 17 stakes winners and more than $11.2 million in progeny earnings. Click to view TrueNicks Enhanced Report for the Exceed And Excel—Black Caviar mating. Exceed And Excel, as Alan Porter noted back in April, rates very highly with Black Caviar by TrueNicks Key Ancestor Score. 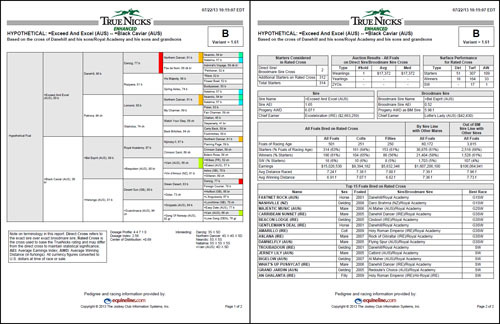 The TrueNicks rating—an above-average B—is based on Danehill and his sons when bred to Royal Academy line mares, the same cross that produced top runner and sire Fastnet Rock. Another positive for the mating is that Black Caviar's own family has had success with the sire. Black Caviar's second dam, Scandinavia, produced group II-winning five-furlong specialist Wilander to Exceed And Excel.